ON Sunday morning February 25, 1996, Israel was hit by the worst terrorist attack in three years. A Palestinian suicide bomber blew up a bus at the rush hour in Jerusalem, killing 23 people. Over the next nine days two more terrorist bombings in Jerusalem and Tel Aviv brought the death toll to 61, shattered the peace in the Middle East, and plunged Israel back into a state of war. I had known the day the wave of terror would begin since the day Rabin died. Right above "assassin will assassinate" there was a second prediction -"all his people to war." Those same words appeared twice more in the Bible, both times with a date: "From 5th Adar, all his people to war." Adar 5th was the same date in the ancient Hebrew calendar as February 25, 1996. The ominous warning of the Bible code - `all his people to war"-had come true on the exact day the code predicted. Again, as when Rabin was killed, I was shaken. The bombings actually shook me less than the new proof that the Bible code was real. Four months earlier, when Israel was at peace, when the peace seemed so secure that leaders of the Arab world came to Rabin's funeral, the Bible code had predicted that by the end of February Israel would be at war. One month earlier, when I met with Prime Minister Peres, that prediction still seemed so unlikely that I was afraid to tell him, and undermine my warning of an "atomic holocaust." And now, on the very day the Bible had predicted 3000 years ago, the war had started, and Peres himself declared that Israel was at war, "a war in every sense of the word." It was a chilling confirmation of the Bible code's accuracy, and all the details of the three suicide attacks were also encoded. "Autobus" and "Jerusalem" and "bombing" all appeared together. Even the street where Palestinian terrorists twice blew up buses, two Sundays in a row, was named in the Bible-"Jaffa Road." The month and year, "Adar 5756," the Hebrew date equivalent to February and March 1996, was encoded with the exact location of the attacks, and the word "terror." 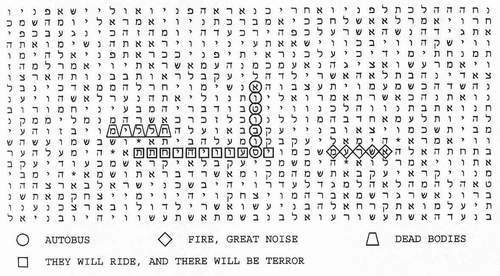 In fact, in the hidden text of the Bible where "autobus" is encoded there was a complete description of the early morning attacks: "fire, great noise, they awoke early, and they will ride, and there will be terror." 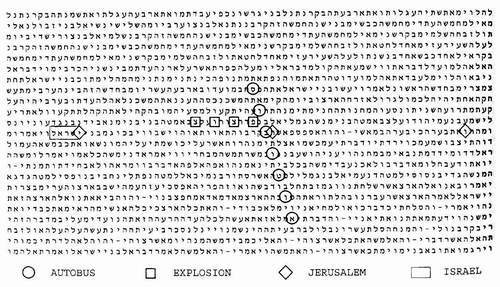 The final terrorist attack, a suicide bombing in the heart of Tel Aviv that brought the death toll to 61, on March 4, 1996, was also detailed in the Bible code. The name of the shopping center, "Dizengoff," appears with "Tel Aviv" and "terrorist." "Terrorist bombing" and "Tel Aviv" were also encoded together. The name of the terrorist group behind the attacks was encoded in the Bible with the weapon-"Hamas bomb"-and running through it was the year, "5756." The carnage in Jerusalem and Tel Aviv, the horrible image day after day of bodies torn to pieces, split Israel in half, divided the Arabs and the Jews, and brought a sudden bloody end to a peace that had seemed so certain. Twisted metal and torn flesh replaced the image of the famous handshake between the now slain Israeli Prime Minister Rabin and the Palestinian leader Arafat. When Rabin was killed, there was only the shock of his death, and of the Bible code's reality. When the bombings began on the exact date the code predicted, the shock was greater. Because I now knew that the code also predicted an "atomic holocaust," a "holocaust of Israel," a "World War." And the ominous warning-"all his people to war"-that was encoded with the Rabin assassination, the warning that so accurately predicted the exact date the new wave of terrorism would begin, also predicted a far greater danger. Two times those same words - `all his people to war"-appeared in the Bible code with "atomic holocaust." ON the last day of April 1996, after Prime Minister Peres met with President Clinton, I met again with Gen. Danny Yatom at the Israeli Embassy in Washington. Yatom had just been appointed chief of the Mossad, Israel's secret intelligence agency. He came out from a diplomatic reception to meet with me. We stood alone outside the Embassy gate, apart from the crowd of dignitaries in the courtyard. Around the entire perimeter, legions of police, Secret Service agents with night-vision scopes, and Israeli security men with guard dogs were on patrol. I gave Yatom a map of ancient Israel, highlighting the mountain where Moses stood in Jordan to view the Promised Land. "If one staging area for an atomic attack on Israel seems most likely, this is it," I told him. Yatom tore open the envelope. "If the danger is real at all, it might be immediate," I said. "May 6th, at night, is indicated." In fact, we had not yet been able to find any date clearly encoded. "May 6th" was indicated, but the letter combination that spelled it in Hebrew came up so often in the Bible that it had no clear meaning. Mathematically, it was meaningless. Still, it was the only apparent date, and it was now just a week away. "I don't know if that date has any real meaning," I told Yatom. "But the Bible code did predict the exact date of the first bus bombing. You may have only one week to check this out." May 6th came and went without incident. Yatom found no weapon. Israel was not attacked. But just when I was ready to doubt the Bible code, it once more came true. A week before Israel's historic May 29, 1996, election-a vote that would decide if it pursued the peace sealed by the handshake between Rabin and Arafat-I found the outcome predicted in the Bible code. "Prime Minister Netanyahu" was encoded in the Old Testament, and the word "elected" crossed his name. On the same line, in the same verse of the Bible, was his nickname, "Bibi." I did not believe it would happen. Benjamin Netanyahu was the proclaimed opponent of the peace plan. Shimon Peres was its architect, and the rightful heir to Yitzhak Rabin. I was sure that Israel would not turn back, even after the wave of terrorist bombings. I was certain that Peres would be re-elected. All the polls agreed. No one expected Netanyahu to win. The day before the vote, I called Eli Rips and told him that I had found "Prime Minister Netanyahu" encoded in the Bible. It was Rips who discovered that "elected" ran across his name. Statistically, it was beyond chance. The odds were better than 200 to l.
If Netanyahu did win, the Bible code seemed to predict that he would soon die. "Surely he will be killed" actually ran right across "Prime Minister Netanyahu" in the Bible. On the next line, again running across his name, was the Biblical threat of premature death: "his soul will be cut off." It is the phrase used specifically to describe the death of a man before he reaches age 50. Netanyahu was 46. His death was not as clearly predicted as Rabin's. The odds that it would be encoded with his name were 100 to 1. The Rabin assassination was encoded against odds of 3000 to 1. But there was death all over the table that predicted Netanyahu's election. "Murdered" appeared twice. The code also seemed to state that he might die in a war. The full hidden text predicting his death said: "his soul will be cut off in a battle." The note I made to myself the day before the election stated, "If I were going only by the Bible code, I would have to say that Netanyahu, if elected, will not live out his term of office." But I was not worried. I did not believe the Bible code could be right this time. I did not believe that Netanyahu would die. I was certain that Netanyahu would not even win the election. ON May 29, 1996, as the Bible code had predicted, Benjamin Netanyahu was elected Prime Minister of Israel. The vote was so close-50.4 to 49.6 percent-that the outcome was not certain until two days after the election. It was a dead heat finally determined by absentee ballots. And yet it was encoded in the Bible 3000 years ago. The White House, the PLO, the pollsters, and the entire Israeli press were all caught by surprise. No one expected Netanyahu to win. Like everyone else, I went to sleep the night of the election thinking Peres had won, and woke up to discover that Netanyahu was the new Prime Minister. Again, I was shocked. I had the same sense of horror I felt when Rabin was assassinated, and when the wave of terror began on the predicted date. The big surprise was not Netanyahu's upset of Peres, but the fact that it had been foreseen 3000 years ago. Once more, the Bible code was right, and I was wrong. It was not merely confirming my own instincts, or predicting the obvious. It was, instead, consistently revealing in advance things no one expected to happen. The danger of an "atomic holocaust" suddenly seemed very real again. It was not only that the Bible code itself seemed real again, but also that "Netanyahu" was encoded with the entire sweep of events that led to the horror, starting with the Rabin assassination and ending with an atomic attack. It was like the pieces of a puzzle coming together, slowly, inexorably completing some horrible picture. "NETANYAHU" fit into place right between "Yitzhak Rabin" and his assassin "Amir," right above the words I had found the day Rabin was shot, "All his people to war." And I now saw that running across the name "Amir" were the words "he changed the nation, he will make them evil." It was as if the crazed gunman had replaced the peacemaker Rabin with the man who would now lead "all his people to war," Netanyahu. And with "Netanyahu" appeared words of Biblical terror-"for the great horror, Netanyahu." Those same words, suggesting an event so awful it has no equivalent outside of the cosmic scale of the Bible, appear again with the prediction of his election, the only time "Prime Minister Netanyahu" is encoded. And the same words - `for the great horror, Netanyahu"-appeared a third time. They were encoded with "atomic holocaust." The day after the new Prime Minister made his victory speech, I called his father in Jerusalem. Ben-Zion Netanyahu is one of his son's closest advisors, the elder of an old Zionist family, whose own father upon coming to Israel changed the family name to a word that in Hebrew means "given by God." Professor Netanyahu is a scholar of the Inquisition, of the ancient origins of the assault on the Jews that led to Hitler's Holocaust. "I have asked your father to give you this letter, because I have information suggesting a threat to Israel that you must understand personally to confront. "The threat is revealed by a hidden code in the Bible that has accurately foretold events that happened thousands of years after the Bible was written. "It predicted the Rabin assassination, it predicted the exact date the terrorist bombings this year would begin, and it also predicted your election. "I do not know if Israel is actually in danger. I only know that the danger is encoded in the Bible. "I take it seriously, because it predicted that Rabin would die in 5756, that terrorists would strike on February 25th, and that you would be Prime Minister. "If the threat of an 'atomic holocaust' is also real, there may be only a short time to prevent it. We have found new information that may reveal a date." WE had finally found the day that Israel might be attacked-the last day of the Hebrew year 5756, September 13, 1996. "Holocaust of Israel" was encoded with "29 Elul"-the date in the ancient Hebrew calendar equivalent to September 13. "Atomic weapon" was also encoded with "29 Elul." It was exactly three years from the day of the famous handshake between Yitzhak Rabin and Yasir Arafat on the White House lawn. If September 13, 1993 was the beginning of peace after 4000 years of war between Arabs and Jews, then September 13, 1996, might be the final horrible blow in that endless battle. Six weeks before the predicted date of the "atomic holocaust," I flew back to Israel. No meeting with the new Prime Minister had yet been arranged. In Israel, I first went to see Eli Rips. The Prime Minister's father had already called him, and while I was there Rips returned Ben-Zion Netanyahu's phone call. The mathematician told him that the Bible code did appear to state that Israel faced an atomic attack. He said that it was clearly encoded against very great odds. But he also said that no one knew if there was any real danger. "There is a code in the Bible," said Rips. "But we do not know if it is always predictive." "The words `atomic holocaust' and `holocaust of Israel' do appear with the current year," he added. "But no one knows if that means the danger is immediate, or inevitable, or if there is any actual danger at all." "What is clear," Rips told the Prime Minister's father, "is that the words stating the danger are intentionally encoded." "He'll meet with you," said Rips when he got off the phone. "He expressed amazement, but he said he would meet with you." "IF this is real, then I will believe in God, not only God, but the God of Israel, and I will have to become religious," said Ben-Zion Netanyahu as I entered his living room. It was a large statement for the defiantly secular Zionist, one of the Jews who relied on guns, not God, to create the new nation after World War II. I told him that I did not believe in God, and was not religious. "How can you say that?" demanded Netanyahu. "It has to be supernatural. No man did this. If there is a code in the Bible, then it is 2000 or 3000 years old. And it reveals what happens now. If it's real, there is a God." "So, why have you come to see me?" he asked, without pausing. "Because the Bible code states that Israel is in unprecedented danger, and the Prime Minister needs to know," I said. "The Prime Minister already knows that," he said. "I know that. We don't need a code in the Bible to tell us that." "But the code states that Israel faces an `atomic holocaust,' possibly this year," I said. I showed him the Bible code print-outs. The prediction of the Rabin assassination. The prediction of his son's election. The two predictions of a "holocaust of Israel" and an "atomic holocaust." "If this is really encoded, then it was encoded by a supernatural being so much more advanced than us, that we are ants. How can we stop it?" asked Netanyahu. Netanyahu and Rips, indeed everyone I met with, seemed to assume that if the code was real, it must be from God. I did not. I could easily believe that it was from someone good, who wanted to save us, but was not our Creator. Clearly it was not someone omnipotent, or he would simply prevent the danger, instead of encoding a warning. All I said to the Prime Minister's father, however, was that nothing was pre-determined, that what we did would decide the outcome. "I will talk to my son," said Netanyahu. "I will try to set up a meeting." WHILE I waited to hear back from the Prime Minister, I looked at the evidence in the Bible code that Israel was in danger. The only encoding of "the next war" again caught my attention. When I first found it, it had seemed clear confirmation of a link between the Rabin assassination and the threatened atomic holocaust. Right above "the next war" the hidden text of the Bible stated, "It will be after the death of the Prime Minister." In the same verse the names "Yitzhak" and "Rabin" were also encoded. But now, when I looked again, I saw that the same hidden text made a second prediction-"another will die." It was striking confirmation that Netanyahu also might be in danger, and it linked his predicted death to "the next war." I went back to see his father, to tell him the one thing I had held back at our first meeting: the same code that predicted his son's election, also seemed to predict that he would die in office. Ben-Zion Netanyahu had already lost one son. The Prime Minister's brother, Jonathan, had been killed while leading the famous commando raid on Entebbe that freed hundreds of hostages on July 4, 1976. In Israel, he was a national hero. I did not want to tell the elder Netanyahu that his other son was now in danger. But if anyone could get through to the Prime Minister, it was the old man I now showed the new set of Bible code print-outs. "Prime Minister Netanyahu" was encoded once in the Bible. The word "elected" ran across his name. "We found that a week before your son was elected," I said. I showed him a second print-out. The word "Cairo" appeared with "Prime Minister Netanyahu." It was the first Arab capital he visited. The third printout showed the words "to Amman," again in the same place as "Prime Minister Netanyahu." His trip to Jordan's capital was set for the following week. "The first three predictions have already come true," I said. "I think we must also take the fourth prediction seriously." I handed the Prime Minister's father the fourth print-out. The words "surely he will be killed" crossed "Prime Minister Netanyahu." The code made it seem inevitable. I assured the elder Netanyahu that it was only a probability, not a determined fact. He asked to see again the prediction of Rabin's assassination, and looked at it silently for a moment. And he said again that he would talk to his son. "I saw my son this evening," Ben-Zion Netanyahu told me the day before I was scheduled to leave Israel. "He doesn't want to meet." "Bibi is not a mystic, he's very practical, very hard-headed, and he just doesn't believe this," his father said. It was hauntingly like the words Rabin's friend used, when I tried to warn him of the predicted assassination: "He won't believe you. He's not at all a mystic. And he is a fatalist." And now Rabin was dead. I flew back to New York and sent a final letter to Prime Minister Netanyahu. He received it just before the Hebrew New Year. My letter stated: "According to the code, Israel will be in danger for the next four years, but this year may be critical, and the days just before Rosh Hashanah may be the moment." The final countdown now began. The Bible code had yet again been proven real, accurately predicting an Israeli election that every poll called wrong, just as it had accurately predicted the day a wave of terror would begin, just as it had accurately predicted the year Rabin would be killed. But as September 13, 1996, the day of the predicted holocaust, drew near, the new Prime Minister refused to heed the warning. It was three years from the day of the Rabin-Arafat handshake. 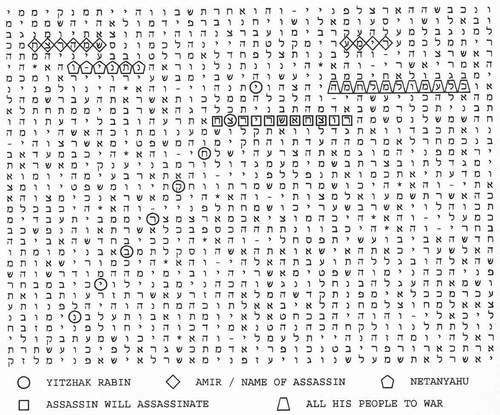 Rabin was now dead, as the Bible code predicted. The peace was now dead, as the Bible code predicted. Peres, the architect of the peace, had been replaced by Netanyahu, the opponent of the peace, as the Bible code predicted. Everything stated for 5756, the year of the predicted "atomic holocaust," had come true. As the year came to an end I could not forget the question spelled out by the Hebrew letters that also spelled the year, the challenge seemingly addressed to us now-"Will you change it?" And then I found that 5756 was also encoded with the "End of Days."